This little wonder is so small and so loud with such remarkable Bluetooth wireless range that it should be in everyone’s stocking this holiday season and in everyone’s pocket or purse or tote bag next year. I was very skeptical upon opening it: how can such a tiny speaker be any good? I was wrong! Charge it up for a few hours, then turn it on. A spoken alert lets you know Mini H20 is powered and ready for action. Connect it to your iDevice or Macintosh wirelessly via Bluetooth in a couple of seconds, or via the included auxiliary audio cable. When using Bluetooth, seal up the small rear port area for waterproof, dustproof, and shockproof enjoyment anywhere and everywhere. There can be a bit of distortion at peak volume, but keep reading, because top volume is ridiculously loud for such a small unit. Check out the specs on the company web site; it’s roughly the size of a medium bar of soap, with padded rubber exterior for durability. Mini H20 is cute, useful, and without equal for a front-facing pipsqueak speaker. Bluetooth range is world-best over fifty feet line of sight without obstructions, and there are no drops to the signal. Speakerphone voice quality is surprisingly good when the unit is held close to your mouth. 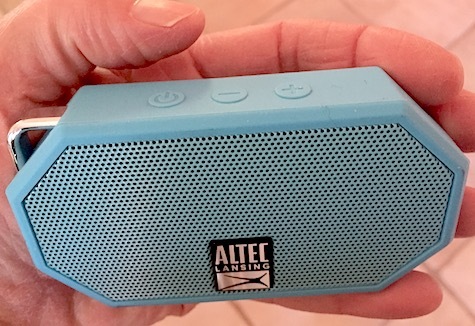 Mini H20 Portable Bluetooth Speaker passes the ultimate Mrs. Nemo “Turn that #$%^ thing down” test, and she likes the looks, feel, shape, and sound quality of Altec Lansing’s latest and greatest diminutive gem. Put it into your pocket, crank up Led Zeppelin, and be prepared to turn heads at your local grocery store before you are escorted out by the security detail. MyMac Review Rating is 9 out of 10. Clean up that distortion at maximum volume and Mini H20 will achieve a rare perfect score. I wish there is a way to make the voice confirmations quieter, but I can live with that. Great product! Pocket Party arrives in a collapsed state. Charge it up via USB and expand the lower suction area and you are ready to party! Stick it onto a flat, smooth, surface, then choose one of the groovy light show displays, especially in a darkened room or outdoor space. You and your pals will dance and laugh for hours. 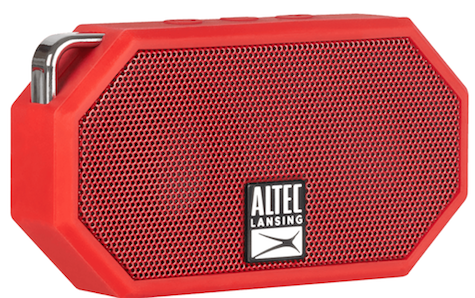 The audio signal uses Bluetooth from your source device, with an omnidirectional range of 20 to 30 feet.. There is no auxiliary input port. Pocket Party can be used as a speakerphone. Take it hiking, camping, tailgating, to school or work. It’s splash proof and drop proof. Audio presence is good in the lower midrange, but without much treble. There is no distortion at top volume. Maximum output is acceptable, but is not especially loud. Study the informative web site and watch the exciting video demos. Then place your order before the price goes up. MyMac Review Rating is 8 out of 10. Fun concept and versatile product, especially with the LED lighting variations. See our previous gift guide items here and here and here.